Tuesday August 22nd 1922 The girls went up town in AM. I had a letter from Ella Nagle. Soon after dinner We went to the train with Fannie Graham. I slept after I came home. Did [illeg; chrseet? - a sewing term?] work Wednesday August 23rd 1922 I wrote Ella Nagle, Tishie Hedges and card to Laura Mason. Went up town. Had letters from Hattie & Joe Williams. Lizzie and I left for Tacoma at 7.25. Spent night at Park Hotel. Thursday August 24th 1922 Left for Yakima at 9.05. pleasant trip. The Lindleys and Culbertsons met us. Home with the Lindleys. rode in evening. Friday August 25th 1922 A month today since I left home. We were out all day with The Lindleys delivering pictures. They took me out to Culbertsons in the evening to stay awhile. A very hot day. Saturday August 26th 1922 Such a good nights rest. Came down town in forenoon, got some more money. Slept in afternoon. Visited in evening. Sunday August 27th 1922 Was sick all night and most of the day. Got up late PM. Monday August 28th 1922 Felt better. Rode down town, got letters from Birdie and Mrs Falk. Warner McCalls returned. I re-sent it and wrote a little more. Rested in afternoon. The Lindleys out in evening. 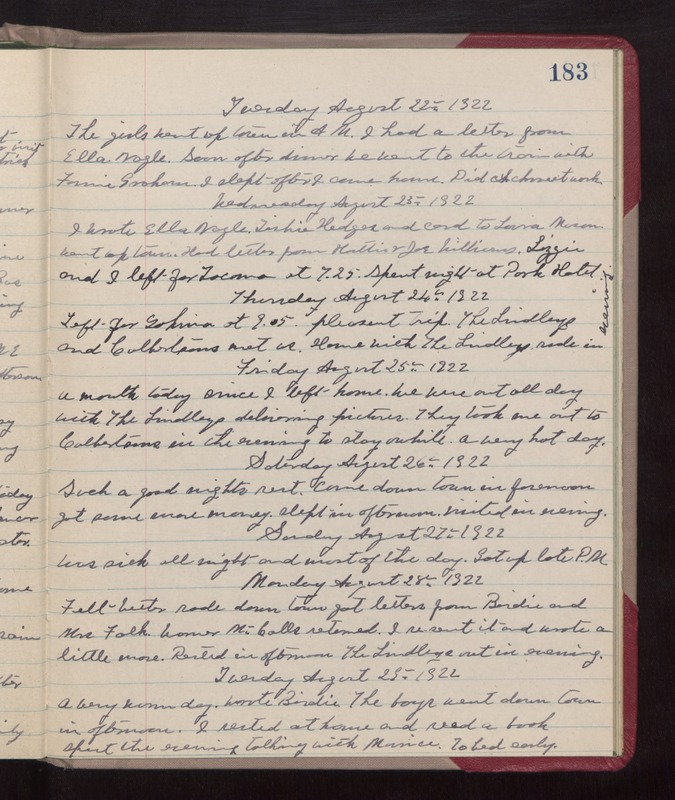 Tuesday August 29th 1922 A very warm day. Wrote Birdie. The boys went down town in afternoon. I rested at home and read a book. Spent the evening talking with Maurice. To bed early.